For the longest time after I returned home from the convent, I was afraid to move in a fixed direction or put down any roots. I didn’t want to commit to anything unless I was sure. Once burned, twice shy… that’s how it felt. I had given everything I could of myself when I was “living the life” in my community. 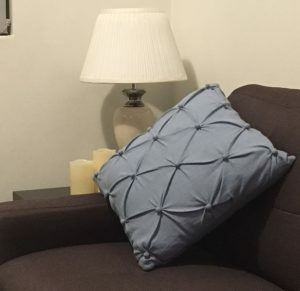 I had committed entirely on an interior level, so when the call back out to the world came it hit me like a ton of bricks. The sense of purpose that I had prior to discerning out of religious life was a hard act to follow. Unless I could find a similarly purposeful direction to move in, I didn’t want to be tied down. 3 years after returning home, I moved out of my parents’ home and took out a lease on an apartment. I decided to allow myself to ENJOY setting up my new home. I went for uncluttered without being minimalist, with a few soft furnishings and bits and pieces to create a pleasant place to relax or to entertain… even a few prints of paintings by local artists of places to which I have travelled in my past… each one, a memory. It sure won’t be gracing the pages of any interior design mags, but it’s home. Why is investing time, effort and $ in homemaking, even important, you might ask? I’d invite you to pick up your Bible and flick to Jeremiah 29. No… not verse 11… that quote about a hope and a future that so many people explore on blogs like this one! Let’s have a look at something different! 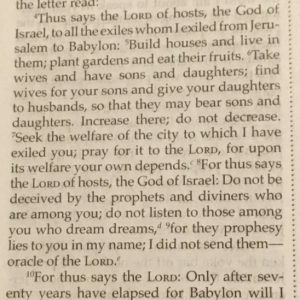 Go right back to the beginning of the chapter to where God addresses Himself to the exiles in Babylon. He tells them to build houses, plant gardens, settle down, get married, seek the good of the society within which they are living. He told them that this exile was PART of His plan for them, that it wasn’t a thwarting of His plan. He reassured them that they were exactly where He willed for them to be, and gave them the confidence they needed to get on with living their exile well. I’m still in the process of trying to work out how to do this well in my own context, and I dare say that this is going to look different for every one who has returned to the world from the convent. I know this much – putting my life into a holding pattern in the hopes that some wonderful life mission or purpose will materialise out of nowhere is not what He is asking me to do. Gabriel didn’t appear to our Blessed Mother in a waiting room. He delivered God’s message to her when she was at work. So again, I invite you – sit down with this passage – and if possible, do so before the Blessed Sacrament. How is He speaking to you through this passage? I pray you’ll find reassurance and peace! 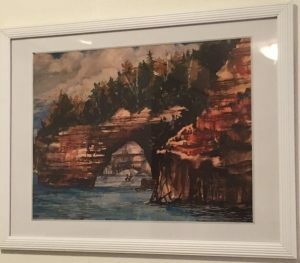 Pictured Rocks, MI – captured by a local artist. It hangs on my wall to remind me of a wonderful memory kayaking under that archway with a dear friend of mine! Prev: From My Inner Cell (3): Let the Light In! Next: From My Inner Cell (5): Coming Soon! I can totally relate to being fearful of setting up roots. Times of transition are nerve-racking at times, but it’s always good to know that it’s going to be okay. ?